A stunning showpiece that doubles as a classic timepiece. 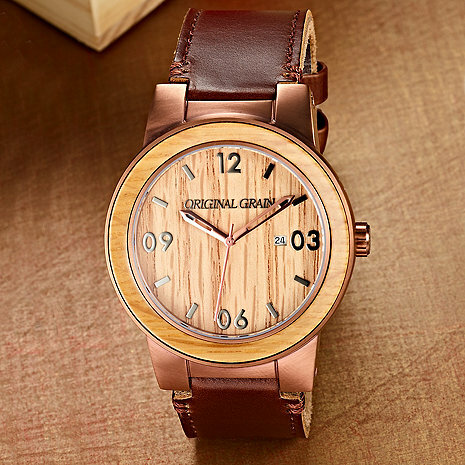 Crafted from reclaimed American Oak whiskey barrels and accented with stainless steel, this watch has swagger. With features like date box, mineral crystal glass, oak inlay, Japanese Quartz movement and a water resistant casing, this whiskey barrel watch is more than just a pretty ‘face’. Versatile for dress or casual wear. The watch arrived in on time. A gift for my husband he really likes it. It is well made, even nicer then the picture on line and in the catalog. I highly recommend this watch for the watch collector as this watch is very unique. Purchased this for my husband. It is definitely a conversation piece! He really likes the wood accents. However, it is a bit large.Would be nice if they scaled it down a bit.